Sgt. Guinness: Sudan 1881 - Gunboat #77 To The Rescue! As the Ansar horde charges home to decimate the Egyptian landing forces Gunboat #77 steams to the rescue spitting lead as fast as she can! Aba Island 1881, is the first clash of arms between the expected one, the self proclaimed Mahdi, and the Egyptian Khedive. This is the backdrop for my con game scenario which I ran at an HMGS-South convention called Hurricon in Orlando Florida in September of 2016. I first learned about this battle form George Carr Jr at a Historicn convention many years ago. Despite doing extensive reading on the Mahdist uprising, the Sudan, and the re-conquest campaigns of the Anglo Egyptian forces I’d never come across this small but pivotal battle before. George had run this scenario for us using his great Ral Partha collection and homemade boat. I was hooked!!!! The battle went very quickly with the Egyptians being wiped out in a few turns so we switched sides and played it again. We had a blast and ever since that day I’d become interested in this battle. Thank you George! Over the years I researched the battle myself and altered his scenario for a larger group of people so I could run large convention games. The flags used are all from the excellent "The Flag Dude" range by Rick O'Brien. The only exception is this green Egyptian standard made by one of our groups daughter with an image supplied by me. We affectionately call our flags Izzy Co. Flags. An expedition is being formed for the capture of a very dangerous fugitive who is calling himself the prophet, the expected one, the Mahdi. He has already refused to come to Khartoum as directed and has declared a holy war against the Khedive of the Egyptian govt. Two companies of troops will be sent to Aba Island by steamer to hunt down and capture or kill this criminal. Whichever officer captures this criminal, promotion is theirs! The other officer will face a fate worse than death, a small command in the outer reaches and wastes of the southern Soudan! In this battle the Officer in overall command and the attached political Officer did not agree on the tactics to be employed or on a common plan of action. Thus they landed troops piecemeal as soon as they arrived to the island without any coordination. To represent this challenge to the Egyptian commander I have split his landing force into (2) separate commands and mandated that they are not allowed to coordinate their actions and must land on opposite sides of the island. Satellite photos of Aba Island today shows the terrain as not being a true island but more of a peninsula, I have modeled it as a true island for this game as it was called an island so it has been made as such. The modern satellite photos may have been taken during the dry season so the Nile level may have been low. Here are the Egyptian forces as laid out in the scenario as printed in the new TSATF Scenario Portfolio. Major Zed Pasha will command the gunboat Zillah, armed with a Nordenfeldt MG and 4 crew. He has at his disposal a 10 man squad led by himself. On this gunboat is Capt. Raouf Pasha commanding a standard 20 man Egyptian platoon. On board the steamer Oasis, is Capt. Ahmed Din Pasha commanding a standard Sudanese platoon and an Egyptian platoon. In this refight the east bank Egyptian commander, Major Zed Pasha, landed his troops in front of some rough ground between two villages. Unfortunately for him there were many rebellious locals hiding in ambush at this very site. As the natives charged the disembarking troops fierce melees broke out which the Egyptian lost and they were forced back into the Nile. The troops still on board the steamer fired volley upon volley at the charging natives trying to stop them from overrunning their steamer. On the opposite side of the Island Capt. Ahmed Din Pasha continued to steam down the length of the island apparently waiting for a target of opportunity. Alas none presented themselves with the natives hiding in ambush for the unsuspecting Egyptians. 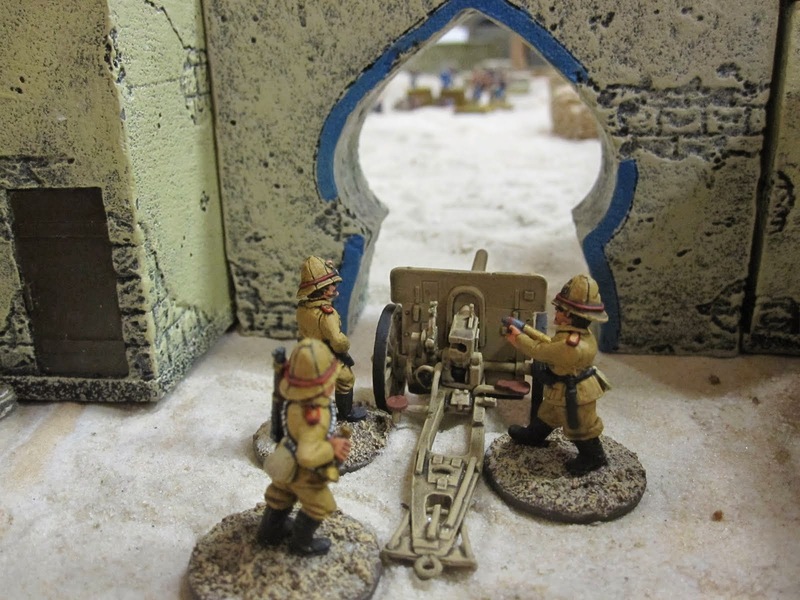 As the battle unfolded on the opposite bank the steamer's gun crew began firing in support destroying a dhow and killing several retreating natives forces, followers of the Mahdi. Major Zed Pasha was able to rally his forces, force back the charging natives, and re-embark his troops on the steamer. He then headed downstream and unloaded his forces, safely this time. As his troops moved inland he discovered more enemy forces protecting the island. Yet none of the houses in the villages were harboring the fugitive Mahdi. The native forces fell back to give ground for time in order to deny the Egyptians their victory conditions. As the two Egyptian commands converged under the protection of the covering fire from the deck mounted cannon the natives retreated all the while inflicting additional Egyptian casualties. With time running out and the Egyptians unable to locate the Mahdi before the designated number of game turns for this scenario the game came to an end with the Mahdi and his fledgling rebellion as the victors! The Egyptians had failed again, unlike as in 1881 where there were horrendous casualties with the Mahdi's forces capturing much arms and ammunition, the loss of life here was far less yet still a crushing defeat for the Khedive in Egypt! I enlisted by buddy Bill Moreno owner of “Good Ground” who makes awesome custom terrain for specific battles to make me a custom game board. He paints like a demon, sells the magnetic movement bases we all use and love, and sells the best 10mm ACW figure line (Cracker Minis) on the market. I’d given him a sketch of George’s table, modified of course, because I can’t leave anything well enough alone and he came up with this awesome layout that we’ve used over 10 ten times in the past 15 years! The photo above is the custom boards he created for me adorned with some of my terrain collection. The boats used in this game are custom made by my buddy “Last Stand Dan”. Please check out his website for pics, WIP’s, great AAR’s of cool battles we played, or to ask him for a quote on a boat. He currently makes different versions of both stern and side wheelers as well as single and double masted dhows. He recently made me a conversion kit to change a dhow to a junk and will be making dedicated junks as well. The rules we use for our colonial games are "The Sword And The Flame" written by the venerable Gunnery Sgt Larry Brom. The rules give a very fun and exciting game with a great period feel. For the naval actions we use our very own Last Stand Dan's rules variant for TSATF affectionately entitled Gunboat & Dhow! This is one of the scenarios that has been included in the newest scenario book available from Sergeants 3, the Brom's company selling all of Larry's rules sets and the official TSATF variants. We miss you Larry!!!! The troops used are a mixture of Castaway Arts, Old Glory, Perry Miniatures, Foundry and Britannia. The links for all of which can be found on the main page of this blog. Rough ground pieces made by my new friend Bill Daniels. Last Stand Dan always has a selection of Bill's terrain to sell at his vendor stands at cons. He makes all sorts of cool hills and stuff. He's currently making me gun positions for my next con game that I just don't have the time to do myself. I'm sure they will be very cool indeed. Well and walls made by Dwight Jones who is a vendor at all the Florida cons! He makes all sorts of great custom hand made terrain! Hills, walls, dice towers, houses, structures, fields, wells, etc which can be used from ancients to scifi. Buildings made by the excellent "Miniature Building Authority". They've got buildings for just about every conflict in both 15mm and 28mm scales for ancients to moderns, and beyond (Sci-Fi). Their products have got to be seen in person to really appreciate them and the expanse of their lines. "Never get off the boat, never get off the $%@#&*? BOAT! Very nicely done Sgt. Guinness! What a great looking table!